The scent of a cozy fireplace surrounded by antique woodwork and endless shelves of books, on a base of smoky vanilla. 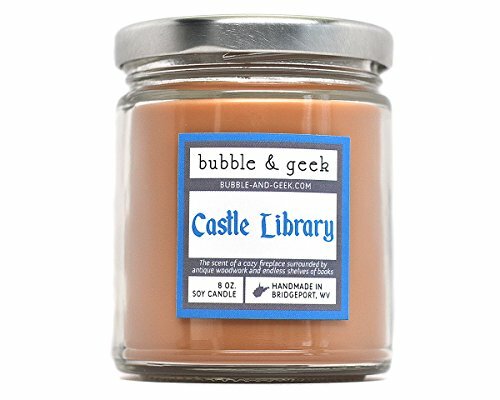 This listing is for ONE "Castle Library" scented soy candle in an 8-oz. jar with silver-colored lid included. The wax color is brown. This 8 oz candle burns for approximately 50 hours. If you have any questions about this product by bubbleandgeek, contact us by completing and submitting the form below. If you are looking for a specif part number, please include it with your message.